When the two biggest players in the electric vehicle, EV charging station industry start working together, everyone listens. Find out what the potential of this means for EV owners. ChargePoint, part of Coulomb Technologies and DBT are the two biggest players when it comes to charging stations in the EV and plug-in hybrid, PHEV field. Pike Research has already pitted these two manufacturers as top leaders of the EV charging stations heap. This is big news that will probably go unnoticed for some time but guess what happens when the two biggest players join hands? I’ll let you speculate. Joint Offering, A Prelude To More? OK, this is only a joint offering but it could lead to the two companies working closer and closer together, thus pulling their weight to define the entire charging stations field. 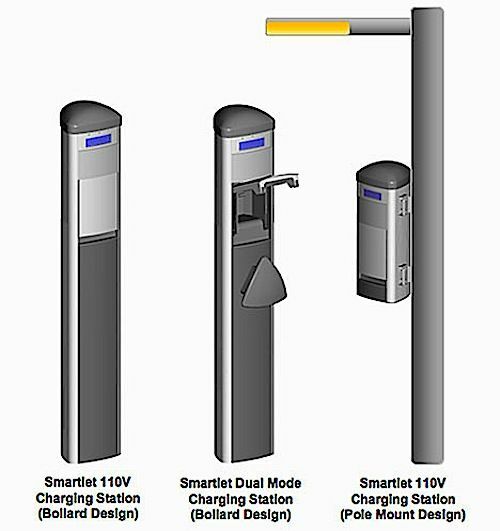 Announced at the Consumer Electronics Show in Las Vegas, DBT USA revealed its North American level II charging stations will have the option to connect to ChargePoint. Why is this important news? We’ve speculate for sometime that Coulomb Technologies, and its ChargePoint entity that describes itself as the largest global EV charging network has been moving more away from manufacturing charging stations toward managing energy. This would be another step in that direction. ChargePoint & DBT in Numbers. How big are they? With over 10,000 units in 30 countries, ChargePoint’s number will be revealed soon but suffice it to say, its network is already present with independently owned stations in over 14 countries. We all know what happens when two giants hold hands down the road, either a consolidation or a strategic partnership that usually defines the landscape of an industry. Think of the early computer days when Microsoft swallowed up local software makers and eventually pulled its portfolio together to offer an office suite called Microsoft Office. Those old enough will remember the problems converging Word Perfect documents, a better word processor to Microsoft’s obscure and anti-competitive behavior. Will the electric vehicle, plug-in hybrid and in general alternative energy vehicle industry go through a round of consolidations, buy-outs and anti-competitive practices? It might be too early to tell but if the past and recent history are anything to gauge from, it could certainly happen. Fortunately, we are nowhere near that point in time and can hopefully learn from our past mistakes and avoid future market share stranglehold. Will have to wait and see how the competition reacts to this news and how it will effect their products. In the meantime, DBT and ChargePoint cooperating is a healthy sign that the EV and PHEV industry is coming along nicely, building up its resources and starting strategic partnerships.